based in the charming and historic village of West Tanfield situated picturesquely on the River Ure. Diners can expect a warm Yorkshire welcome, fabulous food and an excellent wine offer when they visit this unique historic building with enormous charm, atmosphere and character. The Bruce Arms - Bronze winner, Tourism Pub of the Year in the VisitEngland Awards for Excellence, 2018. 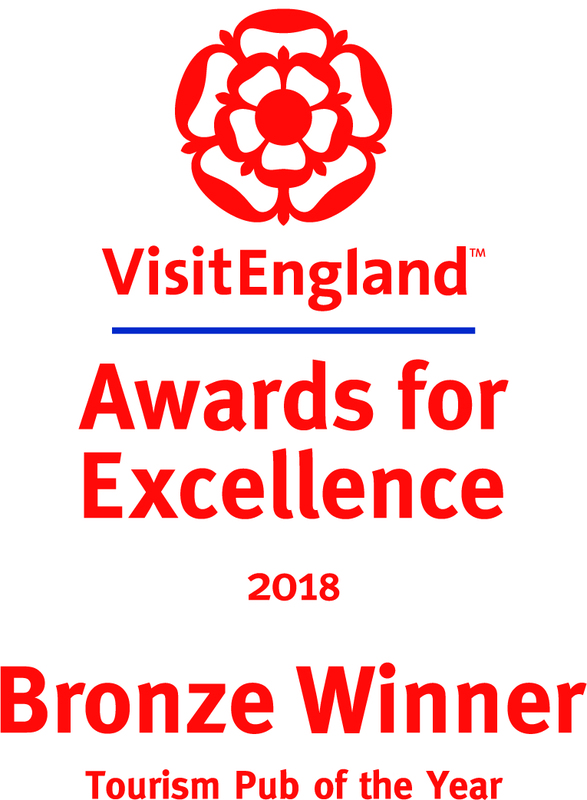 The Bruce Arms, West Tanfield was awarded Bronze the Tourist Pub of the Year category at the prestigious VisitEngland Awards for Excellence 2018 Ceremony. Celebrating excellence across the industry, Gil Richardson and Philip Spellacy of The Bruce Arms, West Tanfield were presented with their award during a ceremony at the Bath Assembly Rooms on 23 April 2018. “The standard of the hundreds of applications we received this year was extremely high and that’s why The Bruce Arms’s accolade is a testament to their excellent work. The Bruce Arms received their award from Nigel Halkes a member of the VisitEngland Advisory Board at a ceremony hosted by Kirsty Allsop. Speaking on behalf of The Bruce Arms, Gil Richardson said “We are all absolutely delighted about our Bronze Award. The team at the Bruce Arms work very hard to make guests feel welcome and to give them a great experience of Yorkshire. It’s so rewarding to have been given national recognition and to have been placed well ahead of so many other outstanding businesses. Contemporary works of art are on display in the 'Fireside Mini-Art Gallery- set in the bar area, and the East Room Gallery Space: currently we have work by Lynne Cameron until end of March 2019. Bank Holidays.... We are open! Apprentice Jack Baldwin, Winner in the Flavours of Herriot Country, Young Chef of the Year, 2018. Jack was also a finalist in the Nestlé, Toque D’Or competition earlier this year. Thanks Jack, for putting so much hard work into the competition and putting yourself and The Bruce Arms on the map. West Tanfield Produce Show 2018. The Bruce Arms was proud to host this annual show and to be part of the magnificent fundraising for local charities. A big thank you to all who took part and to the intrepid tractor drivers who bothered to drive to the event and let us all see the vintage machines which were such a common sight in the countryside.